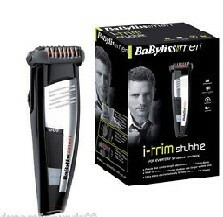 The ergonomic design of the BaByliss for men I-trim stubble trimmer makes it easy and comfortable to use. Featuring electro-chemically sharpened blades for exceptional precision and sharpness, it provides you with a clean, quick and comfortable shave every time. 16 hour charge time for 40 minutes usage. Accessories include: cleaning brush, oil, moustache comb,.